Previously: The John Lawson House. Or some variation thereupon. The writing is weird and blocky, made up of all capital letters and resembling a mosaic in style. Some of them are white, while some of them feature colors like red and blue. 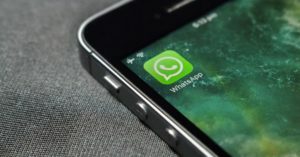 Some of them also include side texts — smaller, more unique messages literally hanging off the main message. They’re usually about the size of an American license plate. Hundreds of them exist. But no one knows quite what the Toynbee Tiles really are. No one knows what they mean, or what they’re for. And although there are, by this point, many imitators, no one knows who first created them. We have some ideas, of course, and a few folks think they’ve totally cracked the mystery. But we don’t have confirmation on whether any of these ideas are correct — and we don’t really know if we ever will. 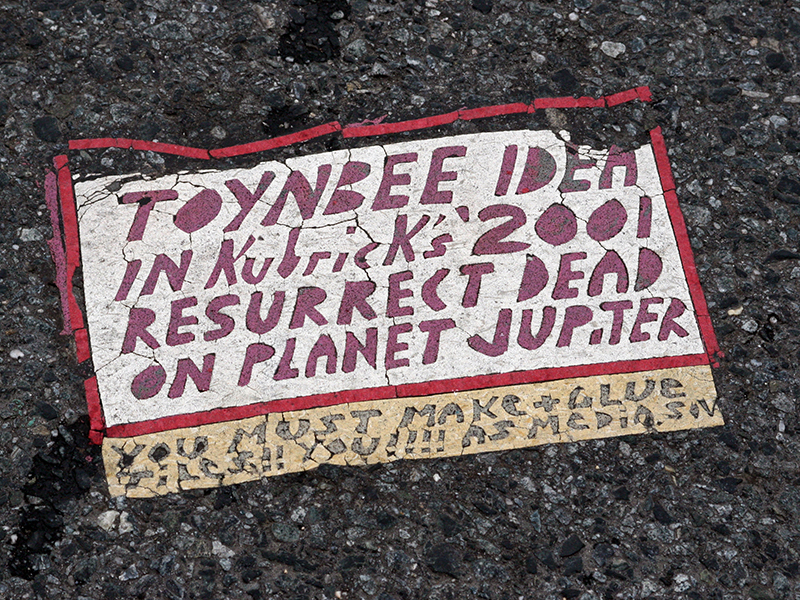 Interestingly, the story of the Toynbee Tiles doesn’t begin with the discovery of the tiles themselves. It begins with a phone call — perhaps even several. Indeed, the headline was, “Theories: Wanna Run That By Me Again?” The column, which was published on March 13, 1983, was short, but summarized “Morasco’s concept that the planet Jupiter would be colonized by bringing all the people on Earth who had ever died back to life and then changing Jupiter’s atmosphere to allow them to live,” which had apparently presented itself to Morasco in the works of 20th century historian and philosopher Arnold J. Toynbee and in Stanley Kubrick’s 1968 film 2001: A Space Odyssey. Morasco said he had founded an organization called the Minority Association geared towards accomplishing this goal, and that he was “contacting talk show and newspapers the spread the message,” DeLeon wrote. The man calling himself Morasco doesn’t seem to have mentioned the tiles, but the elements of their primary message are all there: Toynbee. 2001. Raising the dead. Jupiter. Regardless as to what Mamet says, we have no way to confirm whether the call or calls occurred. Steve Weinik notes that, although the Larry King radio archives are held by George Washington University, “extensive searches never turned up the February 1980 tape.” The lack of archival recordings also means that we can neither confirm nor refute the oft-made claim that 4am functions as a rough transcript of this call. The similarities are oddly specific — I’ve read the play; it’s in the collection Goldberg Street: Short Plays And Monologues, which was published in 1985, and does in fact feature a caller to a radio show discussing Arnold Toynbee, 2001, and the possibility of resurrecting the dead and housing them on Jupiter — but unless or until the tape is located, we’re stuck with a sort of chicken-or-the-egg conundrum. However, if this caller did exist, and if it’s the same who rang Clark DeLeon, then the behavior is consistent with James Morasco’s assertion that he was caller various radio shows and news outlets to get the word out about his organization and mission. 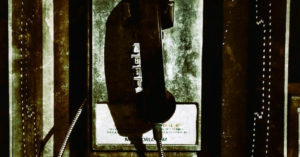 And according to Weinik, he implemented a few other message-sending techniques as well, including the use of a shortwave radio and the posting of handbills throughout Philadelphia. In any event, reports of the tiles themselves began filtering in around the same time as those phone calls, or perhaps not too long after (we don’t know for sure). They’ve been spotted in a huge number of places, including New York, Atlantic City, Baltimore, Washington, D.C., Kansas City, Detroit, Chicago, and Cincinnati. In South America, they’ve been found in Brazil, Chile, and Argentina. They’re in city streets, in sidewalks, on highways, and at rest stops. But the highest concentration of Toynbee Tiles seems to be in Philadelphia — which, in turn, has led many to conclude that Philadelphia is the creator’s home base. They’re believed to be made out of flexible linoleum which has been covered with white school glue and asphalt crack filler and sandwiched between two pieces of tar paper, per the filmmakers of Resurrect Dead. When laid down on a section of pavement, the heat from the sun and pressure from passing cars and feet essentially “bakes” the tile into the ground. Peel back the tar paper — or let it be worn away by time — and voila! The tile will be revealed. They’re not invincible; they can be damaged by weather, time, and human intervention. But after the installation process is complete, the tiles are so deeply embedded in the asphalt that the only way to entirely remove them is to repave the sections of pavement in which they’ve been placed. 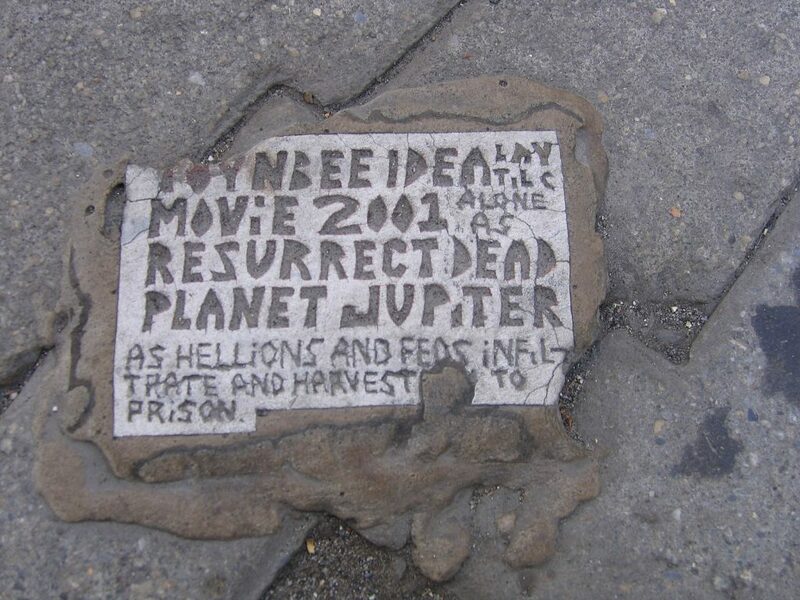 The earliest tiles were quite simple; produced in only one color (white), they stuck to the main Toynbee-2001-resurrection-Jupiter message, and generally didn’t include side texts. As time went on, though, they became more elaborate. The designs began incorporating borders and other details, colors (mainly blue, red, and yellow), and increasingly complex side texts. Sometimes these side texts appeared to be instructions for others to lay tiles; reads one, “YOU MUST MAKE AND GLUE TILES!! YOU!!!! 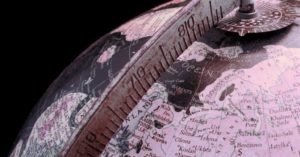 AS MEDIA [illegible],” while another asserts, “YOU MUST LAY TILE -ALONE- AS HELLIONS JOIN UP EN MASS AND GIVE YOU BEATINGS.” Others spoke briefly and cryptically of the tiler himself: “I’M ONLY ONE MAN,” begins one. And some of them are, uh, not terribly pleasant, containing anti-Semitism, death threats against the media (“MURDER EVERY JOURNALIST, I BEG YOU”), and vast conspiracy theories involving the media, the Mafia, and the Soviet Union. One tile — or rather, a set of four tiles which, together, form one unit — stands out as particularly notable; located at the intersection of 16th and Chestnut Streets in Philadelphia, it’s often referred to as the “manifesto tile.” Instead of imparting its usual message, it lays out the tiler’s conspiracy theory in full. In 2001, though, the tiles changed again — and the shift in style was so dramatic that these days, the tiles are thought of as occurring in different periods: The first period covers the 1980s through 2001, while the second period picks up in 2001 and carries through to the present. The messages remained similar, but the designs became widely variable: Some — often found on highways — were made vertical, rather than horizontal, likely for increased visibility by people driving over them in cars; new tiles found within cities were often smaller, about the size of an index card, rather than a license plate; and some weren’t rectangular tiles at all, but instead long, thin strips that created strings of words. In recent years, the tiler has fluctuated back and forth between these more unusual styles and the classic, rectangular design with which he originally began — and he has always, always stayed on message. Technically speaking, we actually do know more or less why the Toynbee tiles exist: They’re an effort to communicate a message to as wide an audience as possible. But what that message actually is, is much harder to unravel — and we’re not totally sure that we’re correctly interpreting the references it makes. Historian and philosopher Arnold Joseph Toynbee (April 14, 1889 – Oct. 22, 1975) is the most likely reference. In some of his philosophical writings, he does address the idea of resurrecting the dead; however, he also acknowledges that doing so is probably impossible. Documents from the Minority Association acquired by the Resurrect Dead from someone who had heard the Association’s shortwave radio broadcast years ago and reached out for more info reveal that James Morasco first discovered Toynbee’s works in 1979. 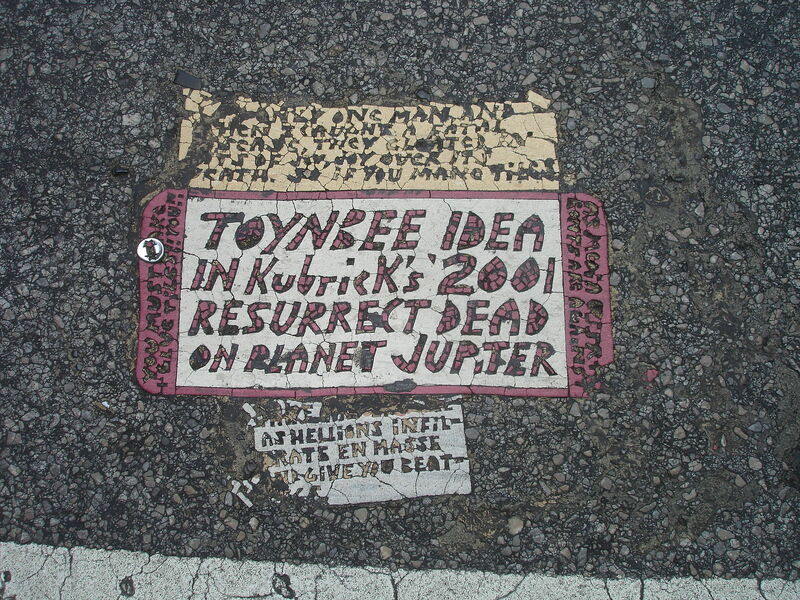 Ray Bradbury’s time travel-based short story “The Toynbee Convector,” which was originally published 1984, is also sometimes brought up in relation to the Toynbee tiles. In the story, the inventor of the aforementioned time machine — the titular Toynbee Convector — says he was inspired by “that fine historian who said any group, any race, any world that did not run to seize the future and shape it was doomed to dust away to the grave, in the past.” By this, he means Arnold Toynbee’s challenge-and-response theory of how civilizations rise and fall. The most obvious part of the message refers to Stanley Kubrick’s 1968 film 2001: A Space Odyssey. Based on several short stories by science fiction writer Arthur C. Clarke and developed in parallel alongside Clarke’s own novel of 2001, the film follows several pilots and scientists sent on a mission to Jupiter and what befalls them when the ship’s computer, HAL 9000, starts acting according to an agenda of its own. As far as we know, Arnold Toynbee’s ideas and writings were not a basis for either Clarke’s original short stories or for the film and novel. Much of 2001, including its ending, are open to interpretation; the tiler may have read it as Dave Bowman literally being reborn on or around Jupiter. Taken together, the message really does seem to be what it says on the surface — and what James Morasco told Clark DeLeon over the phone in 1983. And what about the weirder stuff? The conspiracy theory? The anti-Semitism? The threats against the media? The manifesto tile? Toynbee researchers theorize that it’s connected to the media’s failure to take up the tiler’s message. He, his project, and the Minority Association never received the widespread coverage Morasco was hoping for; as such, he may have grown disillusioned, bitter, and outright angry towards the media. He seems to have had particularly strong feelings about John S. Knight of the Knight Ridder newspaper chain, which formerly owned the Inquirer, DeLeon observed to NPR in 20016; much of the manifesto tile’s vitriol is directed at Knight. And if the tiler was already anti-Semitic…well, you do the math. 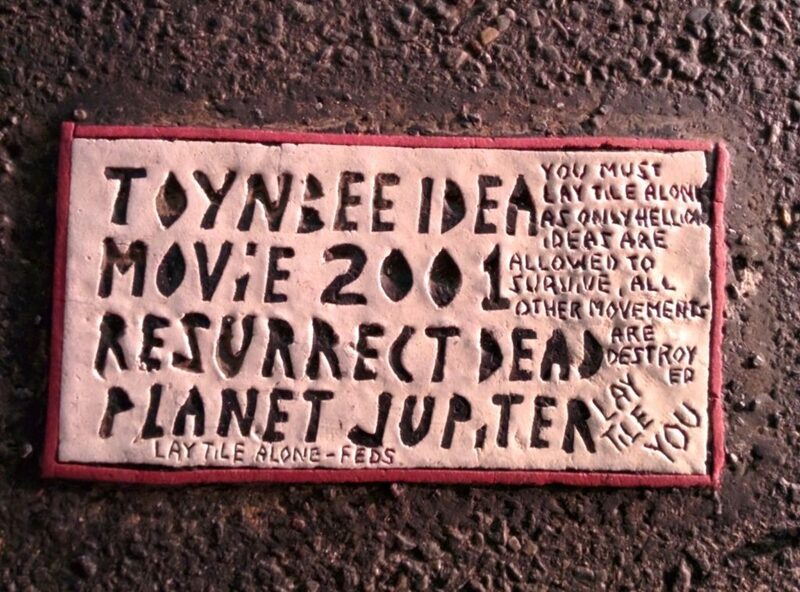 A Toynbee tile once located in Santiago, Chile which has since been destroyed stood out among the other Toynbee tiles for an incredibly odd reason: It contained an address. “TOYNBEE A. 2624 S. 7TH. ST. PHILADELPHIA PA. 19148-4610 USA,” the tile reportedly read. 2624 S. 7th Street in Philadelphia is a three-bedroom, one-bathroom rowhouse measuring a little over 1,000 square feet. It was built in 1925 — and throughout the 1970s and 1980s, according to neighbors interviewed in Resurrect Dead, a railroad worker named Julius Piroli, nicknamed “Railroad Joe,” called it home. Piroli died in 1987, though, and according to property records, the house was sold for $24,000 in 1988. Given the years in which the tiler has been active, Piroli is also unlikely to have been the tiler. Someone does currently live in the house. Please don’t bother them. I’m hesitant to publish the resident’s name, since they’re a private citizen; they’re still alive, and still living at the South Philly address found on the Santiago tile. (Again, please don’t go to the house and bother them.) 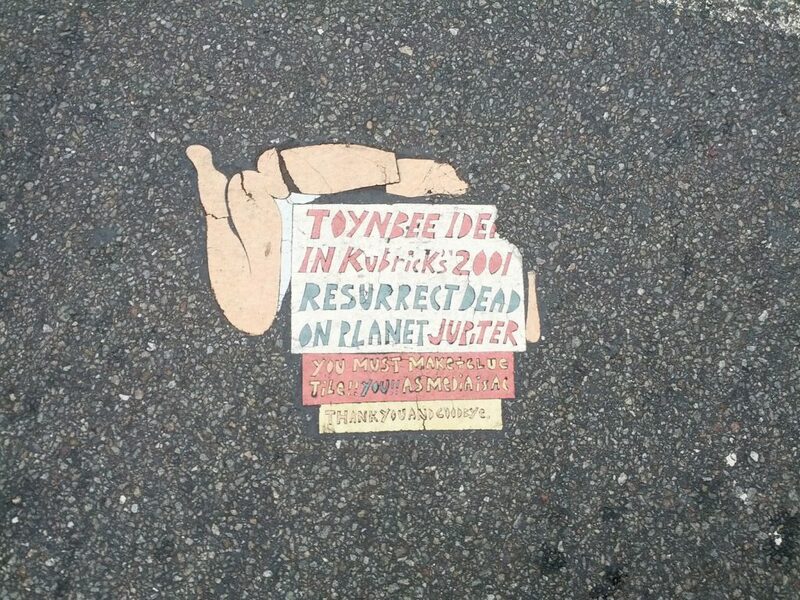 But if you watch Resurrect Dead, you’ll see artist, musician, and Toynbee researcher Justin Duerr, who is at the center of the documentary, and the filmmakers lay out a case for the current resident being the Toynbee tiler. Presumably, the man who answered the door then is the person who still lives there now; property records show that the last time the house was sold was in 1988, after Julius Piroli’s death. The buyer then is likely still the owner now. Duerr visited the address again during the making of Resurrect Dead, but no one answered the door. He also wrote the resident a letter, but never received a reply. The case made in Resurrected Dead is convincing. 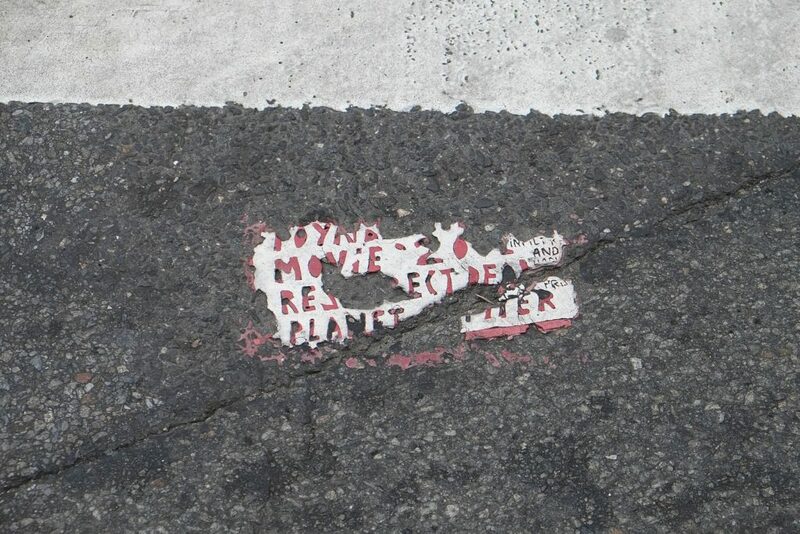 The filmmakers learned details about the resident from neighbors that seem to fit in with the idea that they’re the tiler; additionally, there appear to be “prototype” tiles scattered on the pavement all over the neighborhood — what Duerr and the filmmakers believe were experiments in perfecting the technique used to make and install the tiles. They believe “James Morasco” was a persona the resident created to get their message out. But the resident not only insisted before that they had nothing to do with the tiles, and has not once responded to any communiqué about it. Either they truly don’t have anything to do with the tiles — or they don’t wish the claim responsibility for them. And that, I think, is where we need to leave the mystery. It’s where Duerr leaves it at the end of Resurrect Dead, and I think he was right to do so. We can continue to document them, as Steve Weinik still does, but sometimes, there comes a point where you just have to let the mystery go. 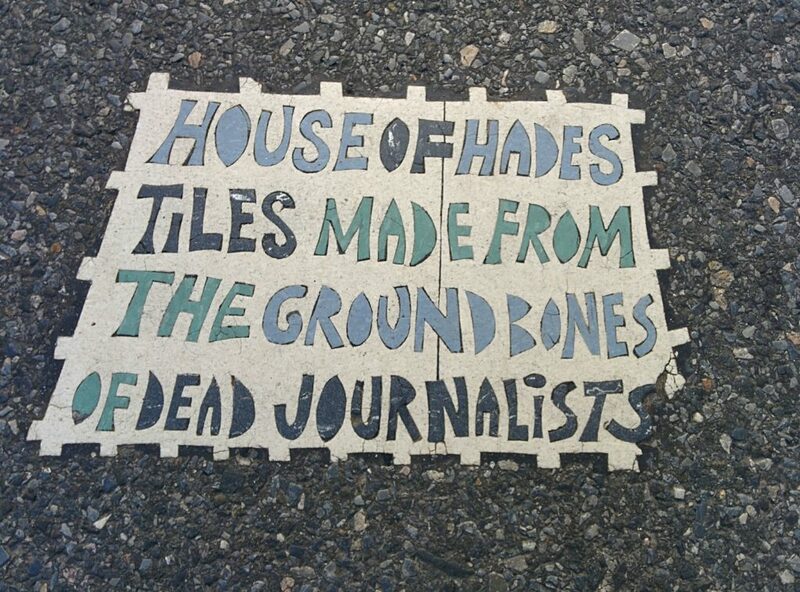 Lots of other artists and collectives have begun embedding Toynbee-style tiles of their own in chunks of pavement all over the world; the ones made by a person or group calling themselves the House of Hades are probably the most well-known, although the street artist Stikman’s are also notable. But the Toynbee tiles remain more durable than many of the copycats — and they’re still appearing even now. Here’s a map of all the ones we currently know about. In fact, there probably are more. Will you go search for them? Will you resurrect the dead? The map shows most tiles were put in Philadelphia but most are destroyed. My question is have there been more recent findings of more tiles after 2001? Another thing, 20016 is waaaaaaaaaay yet to come. These are almost literally in my backyard (according to the map, there was one eight blocks from my house, since destroyed). Thanks for sharing, I’ll have to go search them out sometime! EDIT: Wow. There’s a green one within walking distance too. Will definitely check it out.